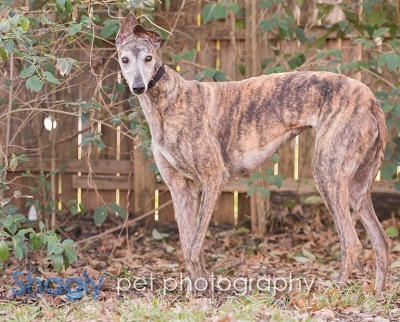 Hot Wire, aka Hot Wire, is a 6 year old brindle female born March 13, 2011. Her sire is Flying Penske and her dam is Okgo Box to Wire. Hot Wire has 97 races to her credit showing on Greyhound-Data.com, starting in Abilene, KS, on April 23, 2012, and finishing at Southland Race Park, in AR on November 5, 2014. From there she went on to whelp at least one litter in July 2015. Hot Wire’s brother, Smokey Joe, is the award winning 2013 All-America and Flashy Sir Award, among other awards. 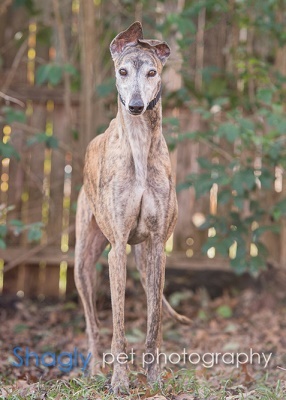 This girl has done it all and is ready to find her forever couch! Hot Wire is not considered to be cat or small dog tolerant. Hot Wire is the very definition of the Velcro dog. If your hand drops to your side, you will hit her on the head; she’s almost attached to you at the knee. That being said, if you are sitting, she is relaxing in the slumberball, hoarding random toys (she loves the squeakies), or sitting beside the chair in case someone should sit down and drop a hand to pet her. Once you start petting her, it will be hard to stop since she is so soft. Hot Wire came into the house and integrated with my hounds seamlessly, she was just another one of the girls. She is very food motivated so if you want to train her for basic commands, she will learn quickly. This cuddlebug will not last long since she is so laid back. Give her a look – she’s a keeper.